(CN) – County officials in California’s Wine Country lambasted their emergency management department on Tuesday, one day after a state agency characterized the response to last October’s deadly wildfires as unprepared. Sonoma County Supervisor Susan Gorin said the decision not to deploy emergency alerts at the outset of the wildfires that laid ruin to a large section of Santa Rosa – destroying 5,000 buildings and killing 25 people – was inexcusable. Gorin lost her home in the fires and along with countless others is reeling from not only the impact of the state’s deadliest fire, but Monday’s report by the California Office of Emergency Services that found the county had a poor understanding of its alert-system options, lacked situational awareness and had significant gaps in its emergency-management protocol. The 34-page report said Sonoma County Emergency Services Manager Christopher Helgren’s decision not to deploy a federal alert system called Wireless Emergency Alert (WEA) was based on limited awareness of how quickly the fires were advancing and an incomplete understanding of the technical capabilities of the system. Helgren, who has been the subject of widespread and pointed criticism, has since been reassigned to a different county department, according to the Associated Press. Gorin was not the only supervisor to channel ire toward the county emergency department staff. Supervisor Shirlee Zane said the staff was repeatedly hostile to oversight and actively kept elected officials from assisting in management of the department. The public comments represent the most pointed rebuke from county officials, though criticisms among the citizens and the press have circulated since the morning after the fires began. The state’s assessment acknowledged the county’s emergency management team was beset by an onslaught of reports of various fires on the night of Oct. 8, some of which turned out to be untrue. It also found the county did send out alerts and notifications, beginning as early as 10:51 p.m. on the night the fires broke out. However, the report said the county lacked important procedures for how to deploy alerts to ensure there were no gaps or redundancies in its alert system. The report also says the county had, at times, a poor understanding of the facts on the ground as wind gusts of up to 60 miles per hour sent the fire barreling from the surrounding forest into neighborhoods. “The assessment team found that, during the early hours of the disaster, the county lacked reliable, timely, and coordinated situational awareness as to the scale, size, and scope of the fires’ growth, character, and movement,” the report says. While several fires broke out all across Northern California on the night of Oct. 8, ultimately burning more than 200,000 acres and killing 44 people, the report focused mostly on Sonoma County, where the majority of the damage and fatalities occurred. 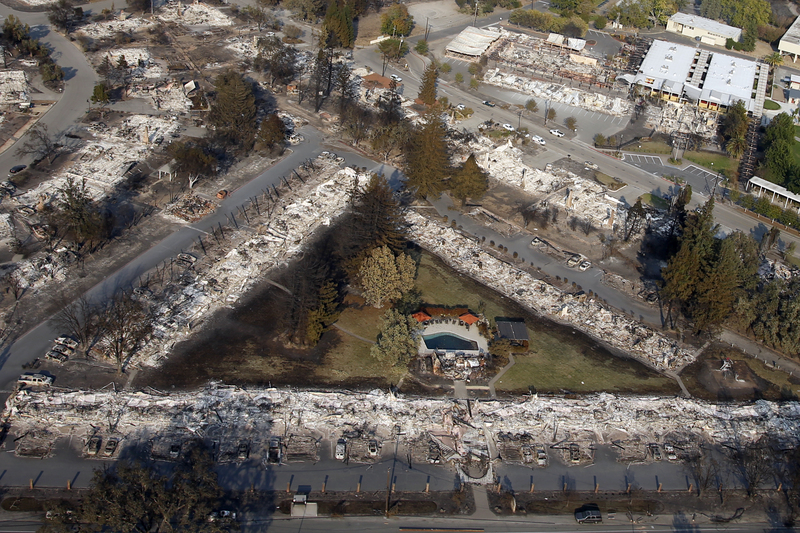 The Tubbs Fire alone, which began in Calistoga to the east of Santa Rosa, burned 40,000 acres, ripped through 5 percent of the North Bay city’s housing stock and killed 22 people. The report made 11 recommendations on how Sonoma County can improve its emergency management system, including an updated emergency response plan with clear protocols, a more clear delineation of roles and responsibilities when it comes to responses, decision-making and alert disseminations and more preparation including scripted evacuation messages alert operators can deploy quickly. The news comes on the heels of one of the worst wildfire seasons in the history of a state that has seen its fair share of wildland blazes. On Tuesday, Santa Rosa Fire Chief Tony Gossner was in Sacramento, where and he and other fire officials pleaded with state legislators to release money to address a strained mutual-aid system. Fire officials are asking for $100 million to update the system.